If wineries, Italian food and good times are up your alley (and let’s face it, of course they are) you’re going to want to know about A Little Bit Of Italy In Broke. Spanning 12 venues, this all-encompassing food festival showcases local produce, cooking classes, workshops, demonstrations, vineyard and olive grove tours, and the region’s renowned local wines. Relaxation and indulgence is yours for the taking, with plenty of musings on the menu. Many of the venues are teaming up with local restaurants for the festival to bring gastronomical delights to visitors, with a host of options available for delicious, fresh, authentic Italian cuisine. Game of Thrones returns for its eighth and final season on Monday the 15th of April, and on Sunday April 14th Mjølner will be hosting Game of Thrones Single Malt Scotch Whisky Collection tasting experiences in its Sydney and Melbourne restaurants. The two hour tasting event will give whisky lovers the chance to sample the entire collection, each paired with a selection of artisanal charcuterie and cheeses. Tickets start from $80 and will be available from 12pm, Thursday 4th April online at mjolner.com.au and The Game of Thrones Collection Single Malt Scotch Whisky Collection is available from liquor stores nationwide now. Scenic World is a name synonymous with the Blue Mountains, now so more than ever. Sculpture at Scenic World is Australia’s premier outdoor sculpture exhibition, which transforms one of Australia’s most iconic ancient landscapes into an outdoor gallery. The rainforest plays host to a range of exhibiting artists who consistently inspire with their creations. This year, visitors young and old can expect to be wowed by the artistic talents of a range of local, national and international artists. Once that’s over, browse an extensive program of free events including daily guided tours, weekend workshops, kids’ activities and a range of other exhibitions happening about town. Immersive dining is the way of the future, or so says Surry Hills favourite Chin Chin. The restaurant will be hosting an immersive dinner in its underground space, Chii Town, which is expected to be a feast of the senses. A major collaboration between the restaurant and conceptual artist Offerings, the interactive feast will host an array of things to touch, hear, taste and get creative with. It’s going to be no holds barred. ‘Immersion’ is a collection of 54 small and large scale sculptures, set within the private valley and protected World Heritage Area that surrounds Emirates One&Only Wolgan Valley. Aligning with the sustainable ethos and focus on conservation that lies at the heart of the resort, expect sculptures created from natural and recycled materials, including Australian hardwood, sandstone, copper and steel. The Argyle opens its doors at 8am on ANZAC Day, Thursday 25 April, firing up the barbie for breakfast. ANZAC Day parade goers will be treated to an all-day BBQ menu featuring bacon and egg rolls ($5), lamb chops ($10), steaks ($10) and classic sausage sangas ($5). The Argyle’s iconic cobblestone courtyard will be transformed into one of Sydney’s biggest and best 2UP arenas, where punters can try their luck at the much-loved ANZAC day game between 1pm and 3pm. Entry is free, and The Argyle’s usual menu items will still be on offer. Fratelli Fresh Darling Harbour is hosting the ultimate, Easter family fun-day on Sunday, 21 April. At 1pm, kids can get crafty with a free Easter hat-making session, before the Easter bunny hops into the restaurant to pose for photos and to deliver 1000 chocolate eggs for Fratelli’s giant Easter egg hunt at 2pm. A generous kids eat free menu is also on offer, which entitles up to four children to eat free with a paying adult. Get your fill of modernised Cantonese classics on Sydney’s lower north shore at Jason Chan’s (ex-Queen Chow Head Chef) new restaurant, Canton Kitchen. Chan blends traditional Chinese restaurant fare with modern flavours to create a menu that serves up the best of both. Think silken tofu with vegetarian XO sauce topped with soy bean floss and crispy wonton skins, roasted Aylesbury duck served Peking style with steamed pancakes and sticky Mongolian lamb ribs with a herb salad. Go with a group and order the 10 course banquet, just so you can taste as many dishes as possible. For something a bit extra take yourself and a loved one on an indulgent three-and-a-half hour Captain Cook Gold Lunch Cruise on Sydney Harbour. The monthly seasonal lunches combine stunning harbour views with superb food and wine. The next lunch in the lineup is Harbour Spice. A six-course celebration of Asian cuisine paired with premium Tyrrell’s Wines and a selection of international beers. The cruise departs King Street Wharf No. 1 at 12pm on Sunday 7 April, 2019 and tickets cost $214 each. If you can’t make this one, make sure you check out the other monthly lunches on offer. Melbourne’s much anticipated Ringwood Spiegeltent extravaganza is rolling into town for seven days, promising a jam-packed line-up of entertainment, cabaret and comedy. Prepare for a completely immersive experience, transporting audiences to the glorious wonder of this iconic late 19th century canvas big top, adorned with mirrors, stained glass, velvet and brocade. If accommodation is your hurdle, Sage Hotel Ringwood is the Official Accommodation Sponsor of Melbourne’s much anticipated Ringwood Spiegeltent extravaganza, and home to a dazzling line up of pre-show animation, cocktails, pre-concert dinner options and a very special Spiegeltent accommodation package. Check it out ASAP. Sound right up your alley? Grab your appetite and head to Canberra’s only dedicated street food event, showcasing and celebrating local cafes, restaurants, food trucks, bars, wineries and breweries. From high-end entertainment to the expression of folk-life through grassroots and community activities, the multifaceted National Folk Festival is the ultimate celebration of all things folk. 20 venues provide a range of concert and performance based experiences, giving you front row seats to a broad and innovative line-up national and international folk performers. Groovin The Moo, aka Australia’s biggest (and brightest) regional touring festival is back for another year, keen to take Canberra music-lovers by storm. Promoters have secured some pretty large international acts, including Billie Eilish, Coolio, Duckwrth and more. Plus, expect a heap of local favourites among the stages, including G Flip, Angie McMahon, DMA’s, Fisher, Jack River and plenty more where that came from. The SPIEGELTENT is back in Civic Square in 2019 with another wild lineup of international prodigies and deviants who’ll lead you on an adventure of hedonistic theatrical anarchy. Starring international clowning royalty Goos Meeuwsen and Helena Bittencourt (Cirque du Soleil), jazz vocalist sensation Fantine, Blaise Garza (Violent Femmes), Rechelle Mansour (Velvet), Tim Kriegler (La Clique) and Brooklyn’s drumming powerhouse Attis Clopton. There’s a reason that Sheffield has become known as Tasmania’s ‘Town of Murals’, and that’s due to this: the truly unique art competition that commences on Easter Sunday every year. Mural Fest sees nine artists compete in a public ‘paint off’, using the same poem as their mural’s central theme and inspiration. The competition is conducted in Mural Park, Sheffield’s very own outdoor art gallery in the heart of Tasmania’s cradle mountain. The event sees the test of artistic skill, endurance and tenacity – so much so that similar events have begun popping up both nationally and overseas. A pretty clear indicator that Mural Fest is doing something right. Celebrating the annual Tasmanian Hop Harvest, Fresh Hop Beer Festival is a delightful excuse for the brewing community to come together and showcase the freshest brews of the year. The harvest ales on offer to lucky patrons are a once a year spectacle, with the hops hitting the brew kettle within 48 hours of being picked. That’s some undisputable beer science right there. As well as beer, there will also be masterclasses, hop education, live music, food stalls and a chance to meet (and bow down) to the brewers behind some of your favourites. For the first time ever, a weekend of food and crayfish is coming to Flinders Island. Expect an all star lineup that includes some of Australia’s most celebrated chefs, as well as a special long lunch that celebrates the island’s beautiful produce. The team behind the festival will spend five days exploring, diving and foraging ahead of the lunch to bring together an experience that is truly unique, and delicious. It’s not that often you get to channel your inner royal and watch a game of polo. But on Saturday April 6th, you just might get your shot. Western Australians are set to gather at Duncraig Stud in the Swan Valley to watch the best Australian and international horsemen play a thrilling game of equine polo for the tenth annual Bentley Polo in the Valley, raising money and awareness for Telethon and Youth Focus. The proceeds from the event are donated to two West Australian charities, Telethon and Youth Focus, which provides free services to young people including psychological counselling services to reduce the symptoms of suicidal ideation, anxiety, depression and self-harm. Discovery – Rottnest Island, the first new accommodation to open on Perth’s island paradise in more than 30 years, has officially opened. Celebrate Rottnest’s simple pleasures in one of the 83 fully furnished eco-tents, nested behind the sand dunes at Pinky Beach. All eco-tents include an ensuite bathroom, pillow-topped bed and furnished private decks, while the deluxe tents offer beachfront views and walk-in robes. Thousands of epicurious travellers and gastronauts will hit the road this April to experience ‘Taste Great Southern Express’ – a fun-filled four day festival in Albany, WA. Wish You Were Beer, (Friday 5 April), a not to be missed evening filled with seafood, shanties and brews! Experience the tasty seafood treats from Liberte’s Amy Hamilton, bountiful brews from Matty Wilson of Wilson Brewing Company and sing along with local favourites, The Shantymen. Albany Wine & Food Festival (Saturday 6 April), where you can enjoy the best of Great Southern’s wine, craft beer, cider, spirits, food, local produce and tourism in a festival to celebrate this great region. 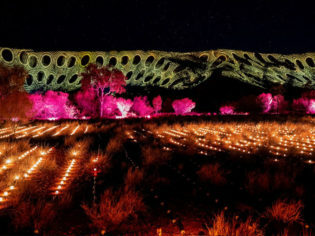 Light It Up Feast (Sunday 7 April), Experience the Field of Light: Avenue of Honour while savouring the region’s amazing local produce, talented local chefs and our Internationally loved guest chef, Adam Liaw. For 10 days, Tasting Australia is your passport to the premium, unprecedented eating and drinking experiences that only South Australia can offer. Take a journey through produce from paddock to plate, sampling the musings of world-class chefs at one of the country’s longest-running food and wine festivals. After an extremely successful inaugural event, this iconic street art festival is back, adding a splash of colour to the walls of Tumby Bay’s local buildings. Located in the seaside town, numerous artists have been invited to spread and share their talent, where spectators are encouraged to attend all weekend long. And in a twist for this year, organisers have arranged with the local transport company to create some mobile street art on a large trailer and prime mover, something which will eventually create another icon that will travel through regional South Australia. Watching paint dry has never been this much fun. All throughout April, guests are invited to explore a surrealist exhibition featuring 23 authentic Salvador Dali bronze sculptures and graphic artworks, in one of the most iconic Adelaide locations: d’Arenberg Cube. Wander through the iconic art (worth over $6 million) and take in the beauty of the landscape. 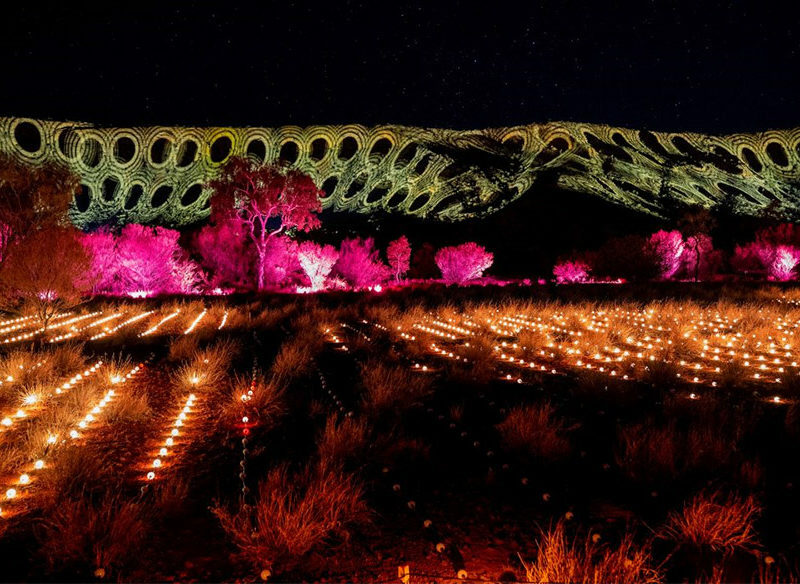 The theme for Parrtjima 2019 is Language Expressions, which aligns with the United Nations Year of Indigenous Languages. This theme helps celebrate the ways in which artists can evolve and experiment with different styles and materials, while staying true to the ancient philosophy of connection and Country. Held across two event precincts over 10 nights, the free event includes incredible artwork and light installations, alongside a 10-night public program of interactive workshops, music, film and talks. Part of the 2019 National Cup, Easter in the Alice is a nationally recognised event through Mountain Bike Australia, as part of the Cross-Country category. Brisbane’s dining fare just got a whole lot more lavish. Originally occupied by the iconic Goldfish Bar (the notorious home to Fitzgerald-era deals) on Ann Street and diagonally opposite King George Square, Goldfinch brings a fresh-faced offering to a site steeped in Brisbane and Queensland’s history. Expect stunning greenery and light-filled layout, served alongside Pacific seafood, local ingredients and plenty of coffee. 3 World premieres, 10 Australian premieres, 4 Queensland premieres, 107 films, 13 locations, 12 days. The Gold Coast Film Festival is bringing film to life this April. Expect intimate seminars and workshops from Australia’s leading producers, writers and directors, all while watching acclaimed cinema from both local and international talent. Special events include the Women in Film Lunch, Movie & Music Trivia, free outdoor film screenings, industry panels and workshops, and SIPFest, the annual short film competition transforming Surfers Paradise beach into a vibrant and unique cinema featuring 12 cinematic masterpieces by emerging filmmakers from around Australia. Quickly becoming the must-do event of Tropical North Queensland, the Undara Outback Rock and Blues Festival attracts a wide variety of both performers and visitors. 2019 will see five high-quality acts performing over three days, making this a weekend guaranteed to suit fans of all genres, held in one of Australia’s most celebrated natural locations.